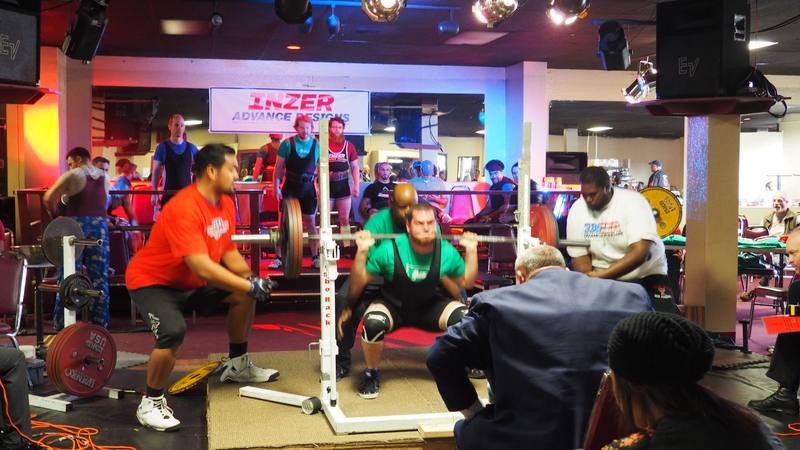 Day 3 IF and some pictures from my power lifting meet! The past two days of IF have been going great. Monday was ok, but I definitely need to make sure that I eat lunch or I start to get a head ache. This morning I weighted in at 183 and I am happy with that as it is over a pound down from last week. Started the same way with just a cup of coffee and packing my things and then headed to Eastside Gym. Today is technically a rest day but I have been using it to focus on building my bench press up. I did not take any Preworkout as I have found that I hold a lot of water when taking creatine and the majority of these already have it in them and iX3 has 6 carbs and since this is a low carb day I don’t like to use them up on that. Once I got to the gym I started with my 400 calories of cardio on the elliptical and actually seemed to go pretty quick this morning. I think the more that I see results the more motivated I am to continue cardio. After my time there I headed to the bench. Warmed up with the bar, 135, 185 and then used 225 for my working set of 5 sets of 5 reps. Last week I successfully hit 5×5 at 245 but I wanted to focus on pause reps this time. I paused for a one count each rep on my chest before pressing. I then moved to floor press where I hit 5 sets at 145 to work on my lock out which I have found to be my weak point. I am pretty strong off the chest but where I seem to get stuck is the top and I am hoping this will help. After the gym I headed to work and had some breakfast once the eating window opened. I had pretty similar meals as yesterday with a slight change in that I swapped out puffed kamut for the 3 musketters. 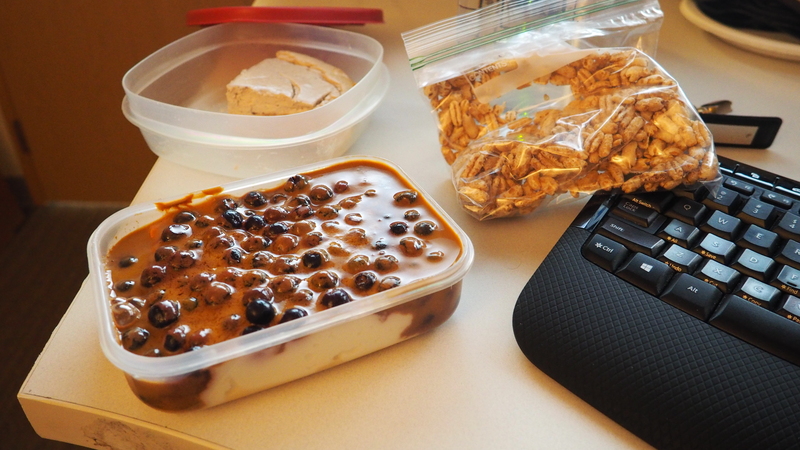 Greek yogurt, blueberries, MTS Whey, PB2 and some Walden’s Farms. Bag of puffed kamut and a slice of PB&J cheesecake. For lunch I met with my brother who now works at the same company as me, now if I can just get him back at the gym in the morning. 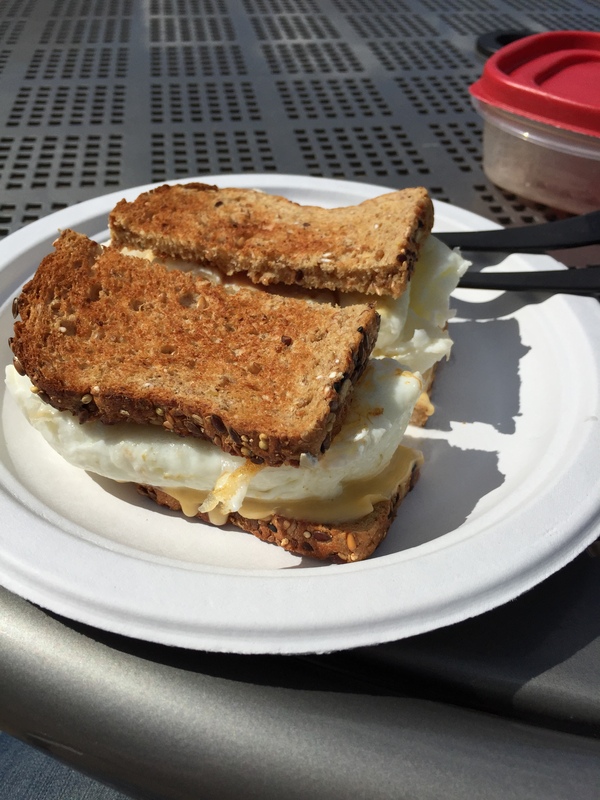 I had a sandwich with smoked chicken breast, egg whites and a slice of 2% American cheese on 2 slices of Killer Dave’s bread. Dave’s Killer bread, egg whites, smoked chicken breast and a slice of 2% American cheese. I had a snack of chopped liver and Kim’s Magic Pops but forgot to get a picture. Once I got home I started dinner to get my food in by 4:30. I cooked up a bunch of Asian veggies, 10oz of leg of lamb and server it with two more slices of bread and 28g of reduced fat feta cheese. 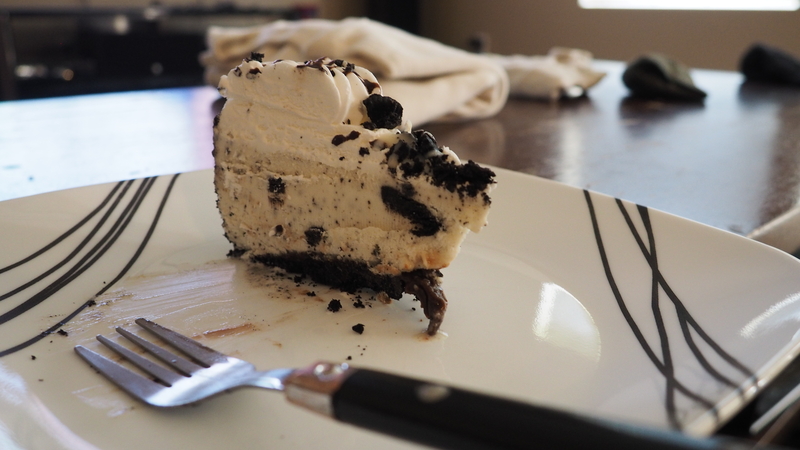 After that I topped it off with a slice of TCBY Cookies and Cream pie. 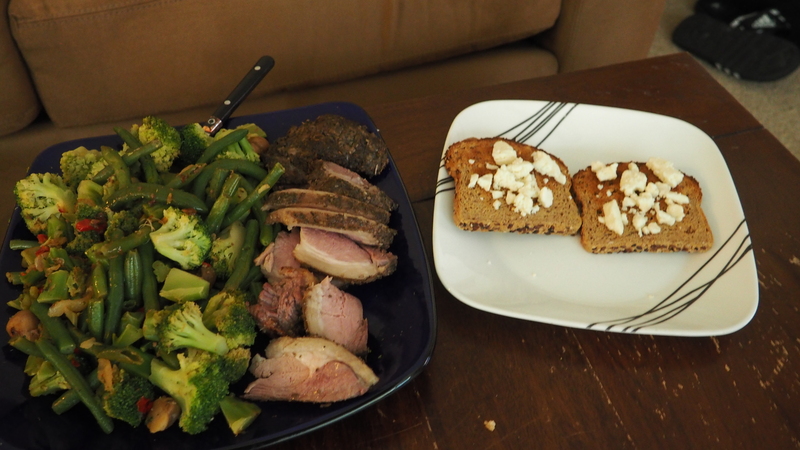 Sous Vide leg of lamb with Asian veggies and two slices of bread with reduced fat feta cheese. I hit my macros on point today and excited for tomorrow as it is a refeed day and I will be hitting 400 carbs! Trying a couple of new foods that I will do a review on! Plus its leg day and I am always excited for leg day! 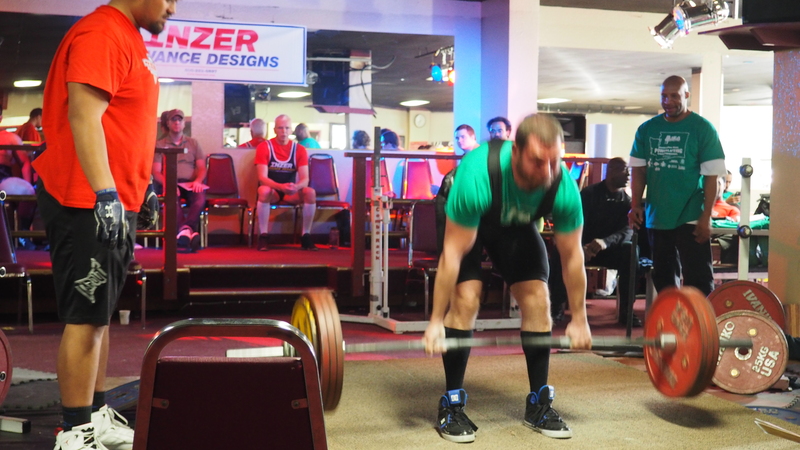 I will leave you today with some pictures from my power lifting meet at the end of February. I have posted me squatting 375, benching 252 and deadlifting 452. Hope you enjoy and hope to improve on these! Have a great night! 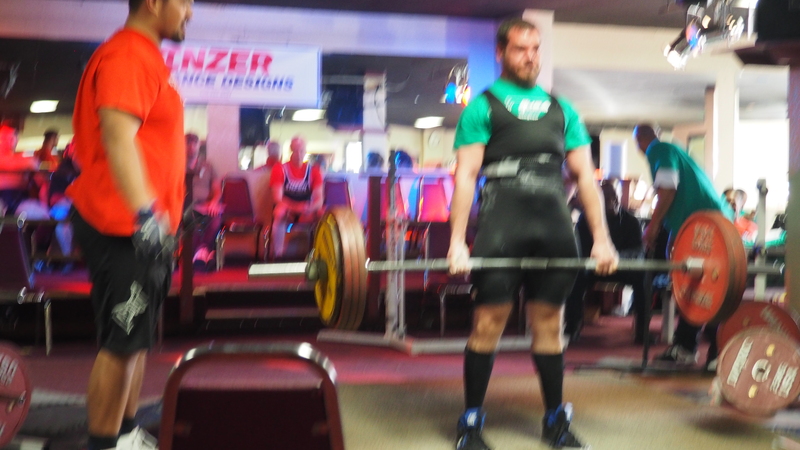 Deadlifting 452lbs at 178 body weight. In the hole with 375lbs.